Highway 3 is the most southerly major highway in Alberta. South of this highway, there is a pocket of wilderness that has been neglected by human progress. 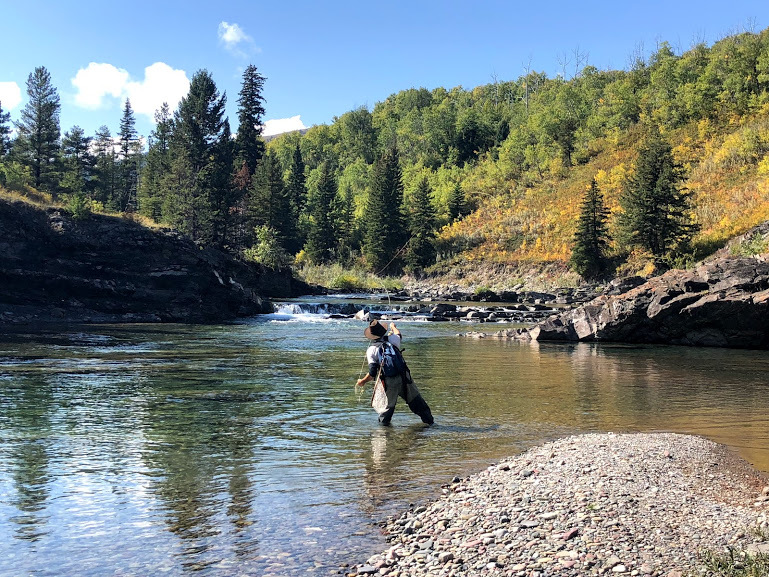 While its northern cousins, the Crowsnest, the Oldman and the Livingstone are being pounded by Anglers, there sits a drainage that is just a little to far away for the average angler. And just the right amount of Wild for the Average Bushwhacker. This is the Castle Wilderness Area. The Castle River is the largest of the Oldman River Tributaries. It is formed where the South and West Castle Rivers join near Castle Mountain Ski Resort. Further down in the prairies, there are several spots to access this River at bridges and campgrounds. 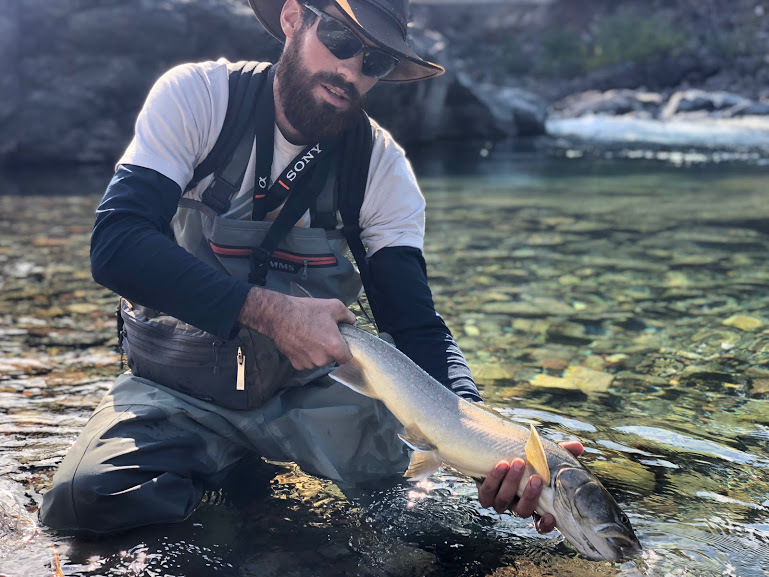 The fishing is very good throughout for Cutthroat, Rainbows, and Bull Trout, as well as Rocky Mountain Whitefish. 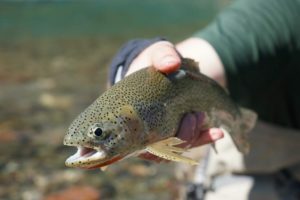 Higher into the mountains, Cutthroat Trout are the predominant fish, and the many tributaries that feed the Castle are full of Cutts. It is these gorgeous feeder streams that made me fall in love with this basin and its raw, rugged mountain landscapes. This region is intertwined with the complex and crucial wildlife corridor known as the ‘Crown of the Continent.’ To the south, lies Waterton National Park, and to the east, on the other side of the Alberta/BC border, lies the headwaters of Montana’s famous Flathead River. Taken together, the Flathead Valley in Canada and the Castle Wilderness Area are a critical transportation corridor for Grizzly bears, facilitating the transfer between populations in Montana and those in Canada. While this is not the time to get too far into this discussion, let us just say that it is crucial that we protect these areas, as further fragmentation of Grizzly populations could have catastrophic results. Luckily, the Alberta government stepped up and turned this region into a Provincial Park beginning in 2018, and much work is being done in the park, including road improvements, marked and designated hiking trails, and campground improvements. This was a popular free camping area, and many were worried these changes would limit these opportunities; but rest assured, there is still plenty of designated ‘free camping’ areas, the only difference being that campers now must register their RV/vehicle at one of the information signs. There are 9 designated camping areas in the park that provide great access to the many great streams this area has to offer. The first time I ventured in here, I got gloriously lost. I turned off the Highway and drove along a poorly maintained logging road for what seemed like hours. It was supposed to be beside the River; there was not a river in sight. The trees were towering pines and impenetrable. Soon enough it was completely dark, I was completely disoriented, and I hadn’t seen any of this prime cutthroat water that I driven 3 hours into the abyss to find. It was now dark. I doubled back to the highway and this time went through Beaver mines, deciding I would head up towards Castle Mountain Ski resort, and turn on Castle River Road, and eventually would get to the spot I had in mind. This time I decided to stick it out, and a good while later, now very late into the night, I finally saw the sign that proclaimed I had miraculously arrived at the Provincial Recreation Area in which I wanted to camp at. I didn’t even pitch my tent. I slept in my car and awaited the morning light so I could figure out where on earth I was. Turns out, I made it to a beautiful stretch of water where Lynx Creek flows into the Carbondale River. The fishing was as advertised. Cutties of pretty decent size smashing dry flies in pools that were invitingly deep and beautiful. The area was in a large burnout zone, which extended up the inviting mountainside valley which easily could have been from Lord of the Rings. I can see why this is crucial bear habitat; if I were a Grizzly, this is where I would live. Since that day, I have returned to this area several times. Each time, I go a little further, and a little deeper, away from the road, and the Campers, and the ATV’s (fortunately, no longer a problem!) and into the mountain wilderness. Each time, I find somewhere to fish that is truly incredible. What makes this area cool is that for each stretch of River that is open and accessible, there is tons of sections of creeks and river that are completely engulfed by trees and canyons and isolated from the campgrounds and recreation areas, despite being no more than a couple hundred yards from the road. 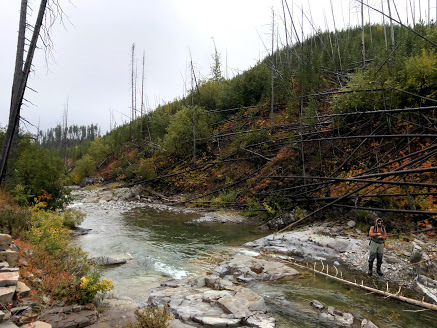 You can get into some of the most untouched trout waters in the world with just a short hike from the bridge or your campground. Just be prepared for tough slugging, and be ready to encounter wildlife. 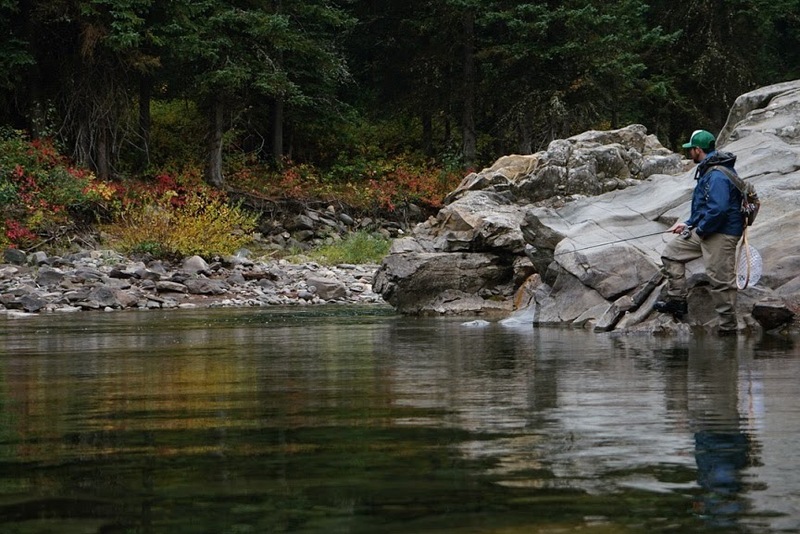 All of the water in this basin has good fishing for Cutthroat and Bull trout. The tributaries that I would recommend exploring include the West Castle River, Carbondale River, Lynx Creek, Lost Creek, Mill Creek. And many more. Highway 507 is your starting point for the entire drainage. There is a campground where it crosses the main stem of the Castle. This is a good spot to fish if you don’t have much time to explore. To access the Upper portion of the Castle, Carbondale Creek, and Lynx Creek, travel through Beaver Mines and take Hwy. 774 towards Castle mountain ski resort. Turn on Castle river Road to access the Provincial Park, or continue on highway 774 towards the ski resort to access the West Castle River. Upstream of the Ski resort, the West Castle is only accessible by heavy duty 4×4 or ATV’s. The fish are smaller but the water is absolutely beautiful, and the small river stretches far away up the valley, as far as one is willing to venture. Give yourself many days to explore this basin and utilize the camping facilities and recreation areas. Bring many extra provisions; there is very little by way of services in this area. If you do need gas or food, the store in Beaver mines is the only place around (they also have the BEST Beef Jerky around). Load up before you head out. I highly recommend using the Alberta Backroads Mapbook to avoid getting lost like I did. Get out there and enjoy this beautiful, gem of an ecosystem we have in right there in our backyard. Immersing yourself in it really makes you appreciate how lucky we are to have areas like this, and why its up to people like us, who enjoy what it can offer us, to protect it. Just make sure you bring your Bear spray!